Sri Lanka conjures up the exotic and the mysterious. Once known as Ceylon, the island boasts a fantastic landscape that ranges from primeval rain forest to the bustling modern streets of Colombo, the capital. A visitor to Sri Lanka has a wealth of options. Relax on some of the world's finest beaches. Explore the temples, halls and palaces of the last Sinhalese kingdom at Kandy. Or take a guided tour of an elephant orphanage. 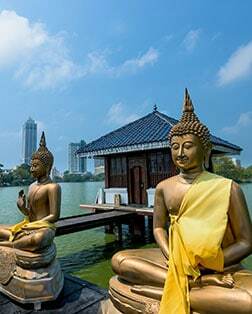 Colombo also offers an array of charms, from the Royal Botanic Gardens, once a royal pleasure garden, to the Pettah Bazaar, where vendors hawk everything under the sun. Colombo and Sri Lanka were shaped by Hindu, Buddhist, Muslim and European influences. Colombo also serves as a gateway for Overland Adventures to India. This 25-acre coconut grove has sheltered orphaned and endangered elephants since 1975. Visitors may watch and enjoy feedings and bathing sessions at this home to the greatest herd in captivity. Thousands of antiquities as well as cultural and historical exhibits, paintings and manuscripts are on display in the galleries of this grand, Italian-architectural-style building opened in 1877. Don't be fooled by the modest exterior of this temple, originally built in the 1870s. Step inside and behold some of the most exquisite and lavish murals depicting early 20th century Buddhist art. Believed to house the upper canine tooth of Lord Buddha, this 17thcentury red-roofed building attracts pilgrims bearing lotus flowers. Richly decorated, the inner shrine is guarded by two elephant tusks. This colorful and lively open-air market in the heart of Colombo is anchored by the striped Red Mosque and is a wonderful place to stroll, sample local delicacies and purchase handmade souvenirs. See firsthand the intricate process of creating some of the world's most renowned gourmet tea products. Learn the steps from grading to packaging and bagging then sample some of the exotic blends. Explore the unspoiled shores of this lagoon which was once a trading port, and visit attractions including a 1672 Dutch fort gate, quaint churches and an ancient temple believed to have been visited by Buddha. Originally reserved for royalty, the gardens were established by the British in 1821 and are renowned for their orchid collection, manicured grounds and over 300 species of exotic plants and blooms.